Learn how different resins are used for softening of water used to feed the water system and their regeneration. Water purification is a necessary process for the water used in pharmaceutical manufacturing because it contains a lot of suspended material as well as in the form of ions. Turbidity and suspended solids can be removed by activated carbon filter but ions cannot be removed by ACF. This form of ions is called hardness of water. Hardness is denoted by Calcium and Magnesium ions. The process to remove this hardness is called softening and water is known as soft water. Some resins are required to remove this hardness. 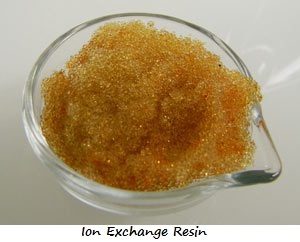 Generally, ion exchange resins are used for the process. These ions of hardness are taken by the resin. The resins are charged by chemicals to release this hardness. Ion exchange resins are white to yellow colored synthetic polymers beads of small size ranging from 0.5-1.0 mm having the pores on their surface to trap and release the ions easily. Important – Resins are solids but measured in the liter.